Conor Swail rode Lothlorien Farm’s Simba De La Roque to victory Thursday night in the $40,000 Pennsylvania National “Big Jump” class at the Pennsylvania National Horse Show. Swail bested a field of 22 to claim the victory. Swail had won the Dash For Cash Speed class the night before with Simba De LaRoque. The Michel Vaillancourt designed course took its toll on many of the riders, but seven managed to post clear first round trips to advance to the jump off. The most challenging combination seemed to be the bending line from fence seven to fence eight, a large square oxer with a Liverpool. The oxer came down a total of eight times throughout the night. Jordan MacPherson riding Aldine for the SVED Stables out of Toronto, Ontario was the first to attempt the jump off course. Making wide turns and not pushing her horse she crossed the timers with 4 faults and 42.56 seconds. She was followed by Michael Hughes, Allendale, NY, and MacArthur owned by Christina Fried. They did not have an easy trip and finished with 8 faults in a time of 39.20 seconds. Next was Swiss rider Beat Mandli and Grant Road Partners’ Zander. The pair was quick but the second to last fence was their downfall. They ended with 4 faults in a time of 36.84. Aaron Vale, Morriston, FL was next to try his luck with Finou 4, an entry from Thinks Like A Horse. Vale was the first to post double clear rounds but his time of 38.13 left the door open. Swail was in the ring next and he and Simba De La Roque, owned by Susan Grange made every cut to finish the course without penalty in a time of 36.33. Peter Lutz, Goldens Bridge, NY and Robin De Ponthual owned by Kathryn Gallagher and Michael Meller were next in the ring. 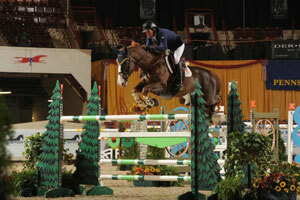 The pair left the ring 36.57 seconds later with 4 faults. The last to contest was Callan Solem, Glenmoore, PA, with VDL Wizard an entry from Horseshoe Trail Farm. As a Pennsylvania girl she had the crowd behind her, and even though she cleared the course without penalty, at 37.22 seconds she was well behind Swail. Recognized as a premier equestrian event, The Pennsylvania National Horse Show runs October 8-17 and has been held indoors at the State Farm Show Complex and Expo Center in Harrisburg, PA since its inception in 1945. Known locally for its contributions to the community and globally for excellence in competition, PNHS attracts top Hunters and Jumpers, sport horse enthusiasts and spectators who find the show exciting, educational and inspiring. Visitors enjoy the intimacy of one competition ring, a full concourse of shops and a variety of special events. Proceeds from the show benefit the Harrisburg Kiwanis Youth Foundation dedicated to youth programs and The Pennsylvania National Horse Show Foundation supporting equine programs. PNHS is proud of its contributions, proud to be consistently recognized by the Show Hunter Hall of Fame and the North American Riders Group, proud of its heritage and looking forward to a bright future.